In this PowerPoint presentation, Packaged Facts discusses the top nine players by estimated revenues in the U.S. pet product market, along with additional billion-dollar range participants. The presentation also highlights major pet brands and product trends. This is a must-read for anyone interested in the pet market. America’s diet has changed drastically over the years, and the dairy industry is facing a new era of disruption and change. 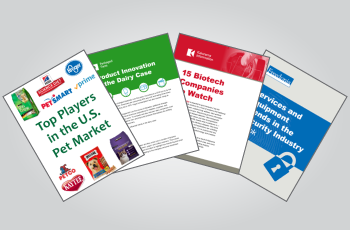 In this e-book, Packaged Facts explores five influential trends in the dairy case. Read this e-book to learn how brands big and small are adapting to the changing consumer landscape. Biotechnology has the potential to provide solutions for a host of problems that traditional technologies have been unable to fully address. It’s no surprise that new entrants are joining the field and investors are highly interested. This e-book describes 15 innovative companies that come from various aspects of biotechnology. Get clear insight into this complex sector. The Freedonia Group's new e-book highlights key developments related to security alarms, global security services, law enforcement, and more. Helpful infographics are also included. These are just a few of the free resources MarketResearch.com has to offer. To access additional downloads, visit our archive of white papers and e-books.